Michael Coe Returns – Gamelyn Games Head Honcho Speaks! I’m talking to Michael Coe this time. Michael, you’ll remember, is the designer of Dungeon Heroes and co-owner of Gamelyn Games. It was a fun interview. I hope you enjoy it. Tom: It’s been a while since we talked last. What’s been going on? Michael: Just been living and loving life Tom. Been spending a lot of quality time with my wife and daughter, she’s one year now! Boy how time flies. Tom: Wow! A year already?! Man that is great. 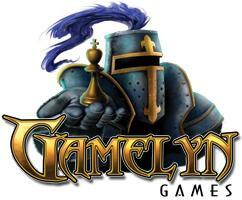 So, tell us about what’s going on at Gamelyn Games? Michael: Gamelyn Games is cooking right now! Things are always hot here at the GG headquarters. The Fantasy Gaming Figures just arrived, the GIANT Meeples will be shortly behind them, Fantasy Frontier is off to the printers and Tiny Epic Kingdoms is gathering a lot of buzz and will be on Kickstarter in January and we’re currently exploring some more unique meeple lines. There’s no rest in this house! Tom: Catch us up on your first success, Dungeon Heroes. Michael: Dungeon Heroes is doing great! I’m nearly sold out of the 1st print run already, the game has only been out since July! Here’s some exciting news for all the DH fans, we are currently in development of a Dungeon Heroes app for iOS. Expect to see the final product around the summer of next year. Tom: I’m really glad to hear that. I remember playtesting DH and I knew it would do well. You recently finished a very successful Kickstarter campaign for Fantasy Frontier. Talk about the campaign a bit. Michael: Fantasy Frontier was a blessing. I’m really grateful to all the Kickstarter backers for their support and belief in this game. We were looking for 25k and ended up a little over 43K. I have to attribute that to the enthusiastic and evangelistic backers. We really had a great support team. Tom: Now tell us about the game. How does the game work? 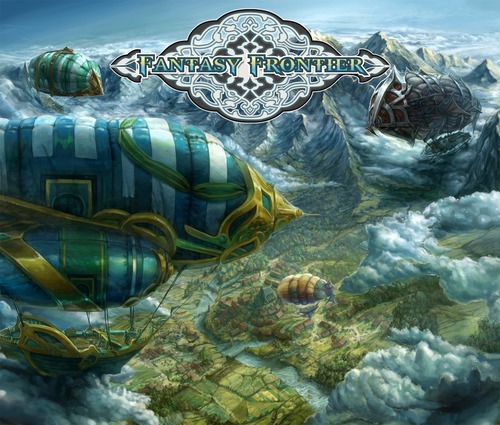 Fantasy Frontier is all about giving players the experience of piloting their own airship and exploring a fantasy world. Players get to choose the actions of their airship crew as they compete against each other for the greatest claim of the board. They will be creating maps, interacting with the land and resources below and even engaging in aerial combat! 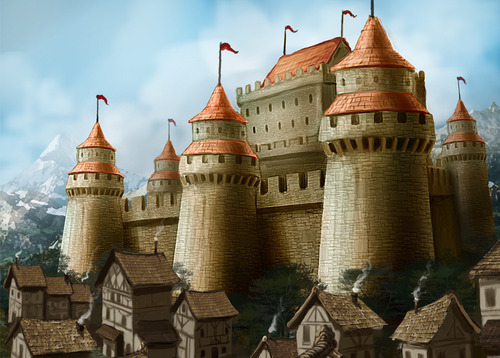 Tom: The art for the game is phenomenal. You were very active showing it off during the campaign. Who is the artist? Tom: How did you find her? Michael: I searched around deviantart.com for artists who had experience with airships and fortunately came across her profile. Tom: She’s going to get a LOT of game work I think. Now you just announced your next game, Tiny Epic Kingdoms. Tell us about it. Michael: Tiny Epic Kingdoms is going to take the gaming world by surprise. It is a brilliant design by Scott Almes (Kings of Air and Steam). TEK is a 4x micro game, which at first, sounds like an oxy-moron. However, Scott has really been able to capture a true and exciting 4x experience in a pocket size game. Look for Tiny Epic Kingdoms on Kickstarter in January of 2014. It will have an affordable micro-game price point but will pack the punch of nearly any of the big box games you have on your shelf. Tom: Sweet. A micro, 4x game. That is an accomplishment. I’m looking forward to it. Ok, let’s talk game design. I have a couple of favorite mechanics. Do you have a favorite design element/mechanic? Michael: Favorite? I have a lot! But as a designer I really enjoy exploring the tile placement mechanic. I’m also a big fan of worker placement and resource management. Tom: Sounds like you’re a placement man. I can understand that. Now, Theme or Mechanic. Which comes first for you?How do you marry mechanics and theme? Give an example if you don’t mind. Michael: There’s no set answer here. Sometimes it’s theme first and other times it’s mechanic first. What I believe is important is marrying the two so that the play experience is enriched by mechanics that compliment the theme. Doing this is not easy and takes a lot of creative thinking and play testing. Lets take Dungeon Heroes as an example. Being that the game is asymmetrical I will just use the Hero side in this example. The theme here being a dungeon crawl, I wanted to capture a player experience that closely relates to what (theoretically) heroes would experience going into a dungeon. A mysterious, dangerous and risky experience that penalizing bad decisions and rewards tactical ones. To achieve mystery, I used hidden information via tile placement by another player. To achieve the danger and risk, I gave the Heroes limited health and gave the other player lethal tools in which to depose of the Heroes with: monsters, traps and even instant death clouds. 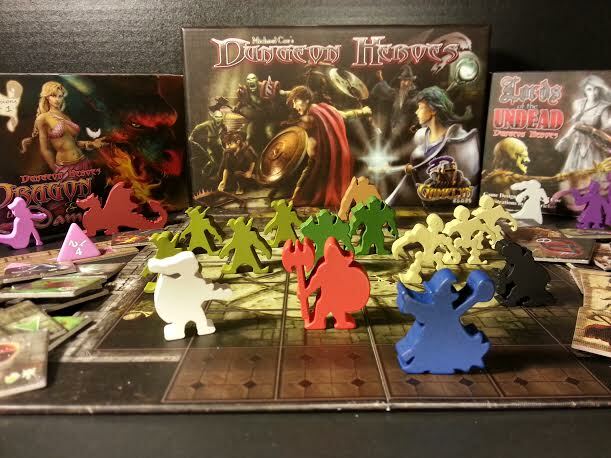 Giving the other player control of the dungeon forces the player controlling the heroes to consider each move carefully. It also plays into the risk/reward element of a dungeon crawl. If the Hero player uses his limited abilities thoughtfully he can overcome the challenges presented by the dungeon player and the end result is very gratifying! Tom: Ok, I can see that in the game. You did a fine job with evoking the dungeon delve feeling. The blind (at least from the Hero side) tile placement really does lend mystery. Next topic – Playtesting. Everyone knows that it is essential for a successful game. How do you do it? Walk us through the process. Michael: Play testing begins with my wife and I typically. After that I get my close friends involved. Then comes the FLGS and any pickup players I can get there. I rinse and repeat this process for some time. I make it to a lot of conventions each year and that allows me to put games in front of a lot of people and not have to play myself. Michael: As a designer, I set out to create games that I want to play. I strive to create novel and dramatic experiences that engage players and put them into the scene and encourage replay ability. I love player interaction and most importantly I want people to have FUN! Tom: I hear that a lot, “I design games I want to play.” Makes sense to me. What are your design goals? Tom: Those are very clear, concise goals. I like that you included ‘approachability’. That’s important. If a game is unattractive, has confusing or overly many rules, is too pricy, or is just too complex it will not get played. And fun. A game has to be fun, whatever you define that as being. So, when is a design finished for you? 1. I feel like my design goals have been met. 2. The majority of people who play it have a great time doing so. I say “majority” because not every game is for every person. 3. It is void of critical, game ruining, flaws. Tom: Gamelyn Games is not a one man show. Your wife, Brittany, is the co-founder. What role does she have? Any games coming from her? Ask her to jump in. Michael: Brittany plays a big role in Gamelyn Games. She is always part of the brainstorming sessions, she filters out bad ideas and helps develop the good ones. We may see a game from her in the future, her and I have some neat ideas for one we’d like to work on together. Brittany also handles the rules editing. As of lately, she has really had a chance to shine with her art used for the Fantasy Gaming Figures. That project was a big success and those are her designs! Tom: That is SO awesome. The Figures look great and they have done well for you too I believe. I can’t wait to see what she has for us next. What’s your favorite unpublished game right now or maybe who is your favorite game designer at the moment? Michael: I’m clearly biased, but Tiny Epic Kingdoms is by far the BEST unpublished game out there right now! Michael: Summoner Wars on iOS. I think I may be addicted. 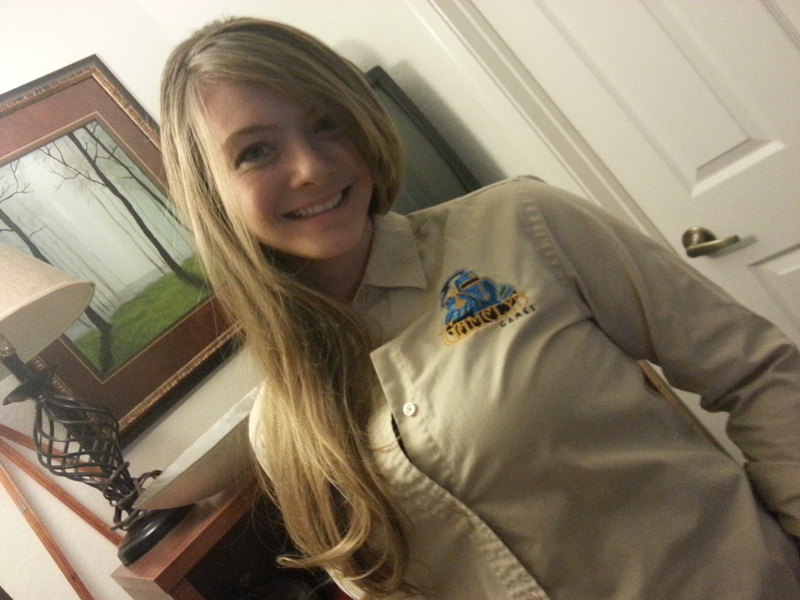 Michael: Agricola: All creatures big and small, there is really a lot going on in that game. It’s deeper than I was expecting and I’ve really grown quite fond of it. Tom: I’ve heard similar things from friends about that one. I need to pick it up. What is next for you? What else is in the queue? Michael: Well, I have a lot in the hopper but I’m putting some serious time and thought into a 4 player Dungeon Heroes. Fantasy Frontier also has a 5th player expansion in the works. Tom: Four players?! That sounds like a winner to me. Can I get in on some playtesting for that one? Tom: Har Har. What was the last good movie you saw? Michael: Killing Season with Travolta and De Niro. The cinematography was very thought out, each shot being calculated and informative. Tom: I haven’t seen that one yet. Is there a particular historical period or subject you feel is underrepresented in game themes? Michael: If so, I certainly don’t design in it. I tend to find myself designing in the fantasy and medieval genre like a lot of others. I would like to see some more medieval horror games like Ravenloft though. Tom: I haven’t played Ravenloft yet. I do like the fantasy theme. And you sure seem to know how to do it well. We’re here at the end. How can people contact you? Are there any links you would like folks to visit? Michael: Thanks again for this interview opportunity and don’t miss Tiny Epic Kingdoms on Kickstarter coming this January!